The excavation of the Archaeological Society at Athens at Zominthos Central Building, which commenced on Monday, July 2, under the direction of Efi Sapouna-Sakellarakis, will continue to investigate areas that were unearthed in the previous years, as well as new areas that will reveal and unify the central axis of the Building. The team consists of numerous archaeologists and specialists in different areas to facilitate an interdisciplinary, well-recorded and multivocal excavation. 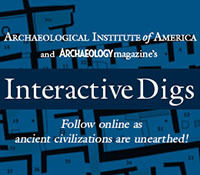 The archaeologists that take part are: Yannis Georgiou, Constantinos Papadopoulos, Eleni Christaki, Antonis Papadopoulos, Giorgos Georgakopoulos, Giorgos Kalomoiris and Zacharis Mavridakis. Also, the archaeology student Erato Vemou. Drawings of architectural elements are done by Kostas Sarantidis, Michalis Zotos, Yannis Androulidakis and Vasilis Chairetis, while finds drawings are done by Kalliopi Theodoropoulou. Also, the team is accompanied by specialists in conservation; apart from Myros Nikakis who is the official conservator of Zominthos Project, this year we have a team of 7 conservators from Knossos, who work on the plasters and frescoes unearthed during the excavation. Also, another craftsman from Knossos collaborate with us on mounting works for the walls of Zominthos Central Building that present stability issues. The excavation takes place in eight rooms/clusters of rooms. Rooms 19/28, which were first explored in 2008 continues this year with the purpose to reach the floor level and investigate its relation to the neighboring rooms 17 (at the west), 15 (at the north) and 26 (at the east). The excavation in Room 26, which has not been investigated in the past, will commence in the second week, with the purpose to illuminate the so-called staircase at the west and its relation to Corridor 10, as well as Rooms 50, 52 and 30, and the north part of the Building. This year, we are also going to excavate Corridor 10, part of which was first dug in 1989-90, in order to reveal its extent to the south of the Central Building. We are also going to continue the investigation in Rooms 7 and 8, which have revealed in the past coloured plaster and frescoes. This year we will also start investigating Room 9, which has not been explored in the past. Lastly, the remaining part of Rooms 30/52, and 50, in which last year we unearthed an elaborate hearth and a column, will be explored. It is also worth mentioning that great effort was spent during spring time on mounting works for the walls of the Central Building, which have been highly affected by heavy rain and snowfalls during winter. Mounting works will also continue for the walls in Rooms 50-52, as well as the central corridor of the building. The excavation is conducted in two different Rooms, 7 and 8, located at the north façade of the building. Room 8 bears a window on its north wall. Since these rooms are plastered, the pace of the excavation is dictated by the quantity and quality of plaster unearthed. Apart for the archaeologist working in this area, there are three specialised conservators who facilitate the conservation of the fragments on the spot and their safe removal. Room 8 (fig.1), the eastern one of the two rooms, has revealed a semi-circular construction, which was found in 2007 and removed in 2011. The dig continues in depth unearthing pieces of plaster bearing mainly red but also orange, yellow, gray and black colours (fig.2). In Room 7 (fig.3) the excavation has just began and has brought to light some pieces of plaster (fig.4). Room 9 bears a window on its north wall and is located at the north-central part of Zominthos Central Building, to the east of the main entrance that leads to Corridor 10. The Room covers approximately 10sqm. As it has been already realised since the excavation of Room 8 in 2006, at the southeast corner of Room 9, there is an opening through which it communicates with both Rooms 7 and 8. Apart from a surface cleaning that took place in 1980s, Room 9 has not been previously investigated. Until the end of the week, in Room 9 we excavated three layers which revealed a large number of stones of various sizes – among which some of a significant size, which seem to belong to the east wall and the northwest corner of the Room. Some of them have also fallen from the west wall (fig. 1). We unearthed several sherds and fragments of animal bones, as well as some pieces of carbonised wood. At the central part we revealed several pieces of a large pithos (fig. 2), while plaster has been unearthed across the east wall. It is anticipated that the number of plaster fragments will be gradually increased, as is the case in the neighboring Rooms 7 and 8. Rooms 19 and 28 are located at the north-west part of Zominthos Central Building and were first excavated in 2008. In this year’s field season we will investigate the northeastern limit of Room 19, the western limit of Room 28 and its relation with Room 27. As well, the possibility to have an opening at the southeast side of Room 17 and its connection with Room 28. At the moment, at the northeastern corner of Room we revealed the continuation of Wall Δ (see last year’s reports) (Fig.1), at the south of Corridor 16. At the west/southwest part of Room 28 we completely unearthed Wall E as well as another wall, named Wall Z (Fig. 2) that seems to be a later addition to the existing walls to facilitate the construction of an opening to Room 17. The most important find was a seal made of steatite bearing a scorpion to which we are going to apply Highlight RTI (see relevant section) to enhance the understanding of the depicted scene. Among the other finds were two stone grinders (Fig. 3), a small piece of rock crystal as well as part of a characteristic spouted jug (Fig. 4). This year we removed some very big limestones, which have most probably fallen from neighbouring buildings or a probable second storey, resulting in anomalies on the surface of the paved floor that is gradually revealed. Regarding the unearthed finds, we had several sherds of different chronologies, an intact conical cup (fig. 2), as well as numerous animal bones. This room belongs to the earliest construction phase of the building and is situated on the top of the hill, at the same axis with the contemporary rooms 51, 52 and 30 (which also have paved floors, just like room 50). We cleaned the area near the northern wall, where stones and soil were fallen. At the same time, mounting works were carried out (fig. 1). Fallen pieces of plaster were removed across the western wall. This showed that the surface of the wall was covered with white plaster. At the southern half of the wall, a bench was revealed, which was plastered, too (fig. 2). The whole room (fig. 3), with its paved floor, column base, hearth and bench, is quite exceptional. Part of Corridor 10, about 9.30 m. from the threshold at the north entrance of Zominthos Central Building was first excavated in 1989-1990. This year we continue investigating the extent of the corridor to the south of the building with the purpose to reach the floor level and facilitate the access to the building through the main entrance. For this reason, in parallel to the excavation in this area, mounting works take place at the east and west walls of the corridor which have a strong inclination due to the strains by the heavy rain and snowfalls in the winter. During the first week, the excavation proceeded in five layers revealing a large number of huge monolithic slabs fallen from the neighbouring buildings. The dig so far indicates that the corridor does not end at the corner of Room 50, but actually continues to the south end of the Building. Also, we identified an opening at the west wall of the corridor that leads to Room 26, the excavation of which will commence in the second week (fig. 1). The finds unearthed showed that the layers are quite disturbed. For example, in the first layer we found a black-glazed handle dated in the Classic/Hellenistic period, while in the second, a relatively modern sheep’s bell (fig. 2). Deeper we found an archaic sherd and some more black-glazed fragments along with Late Minoan sherds. Among the special finds were an intact one-handled cup (fig. 3), a conical cup and a cup with straight sides, as well as a perforated object made of bone, rectangular in section, which bears incisions in all its four sides (fig. 4). Zominthos is the first Greek excavation that employs a wearable camera (Looxcie II) to record moments of the excavation. The camera is mounted on the ear and aims to the areas that eyes see. In such a way, the captured scenes follow exactly the same movements that the head and the eyes do allowing an immersive experience in the observation of the excavation process. The Zominthos excavation is also the first Greek excavation that employs highlight RTI image capture to derive details of objects’ surface shape based on the interaction of a light source and the object. The process is relatively easy; you have to take numerous shots with the object and the camera still, while changing the angle and position of the light source. Two reflective spheres record the reflection of the light source, enabling the processing software to calculate the lighting angle and enhance the surface details of the captured object (for details see c-h-i.org). The first find that we are going to capture with this technique is a seal made of steatite which depicts a scorpion and other smaller subjects. This method will enhance our perception of the scene, since we have not been able to macroscopically fully identify the depiction. Images from the Looxcie and RTI will be posted in the coming weeks! This entry was posted on Saturday, July 21, 2012 at 11:01 am	and is filed under Field Notes 2012. You can follow any responses to this entry through the RSS 2.0 feed. Both comments and pings are currently closed.